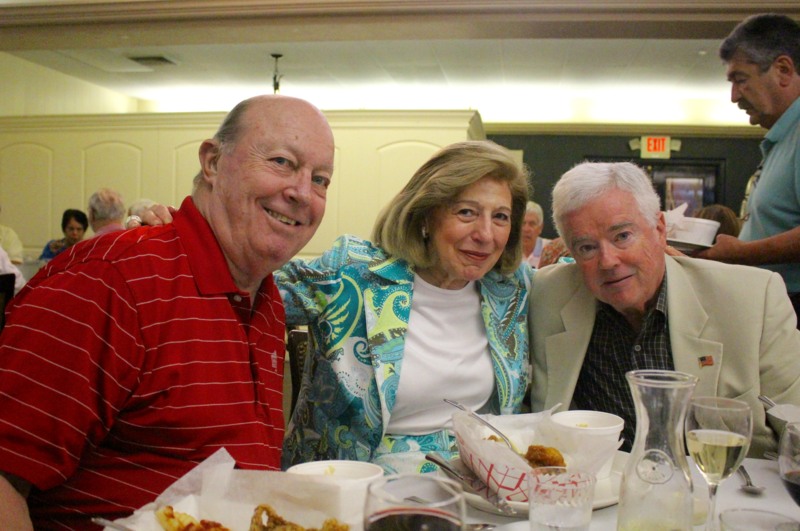 The St. Lawrence Club was packed on Friday night with fans of The Clam Box restaurant. The Belly Burster Menu, overseen in the kitchen by Tony DeVita, featured clam chowder, fried clams, fish & chips and cole slaw, and the meal was topped off by Ice Cream Sundae Bar. Among the nostalgic crowd was Andrew R. Melillo who wrote his family history and genealogy, which was on display alongside the vintage Clam Box photos. Andrew said the genealogy was published this year, after two-years of research, kicked off in 2014 a trip to Rose, Italy. Andrew, photographed holding the book open to a page with a photo of his my grandfather, Rocco Victor D’Andrea, Sr, who had just become and 1st Class Lieutenant at Fort Leonard Wood, Missouri and was to then go to The Philippines while it was still occupied by axis forces. Andrew’s middle name is Rocco, after his grandfather. The photo was from 1944. His war efforts began when he left the CT Highway Dept and was awarded a commission to help expand the Panama Canal in 1942. Among the hungry crowd at the St. Lawrence Club were former wait staff from the legendary restaurant, the “Lally Girls,” Kathy Cullen and Pam Curley. Kathy, who still has her apron from the years she worked at the Starboard Port, and Pam, bouncing baby grand daughter Bailey Alice Lennon on her knee, shared a collage of vintage Clam Box photos (see below). The Lally Girls wore t-shirts designed by Brendan Cullen to commemorate the night. Among the fans of the restaurant, which closed its doors in Greenwich in 1985 was Flo Menagalos who worked at the Clam Box for 25 years. She started working at the restaurant in 1937 when she was just 14, and met her husband Charlie, known as “Charlie Brown,” while working at the restaurant. At Friday’s nostalgia dinner, Flo shared some of her memories of work memories. …Click here to read the entire GFP history of the Clam Box.